North Korean state media reported the groundbreaking for a project to reconnect inter-Korean railways and roads on Thursday, a day after the ceremony took place. 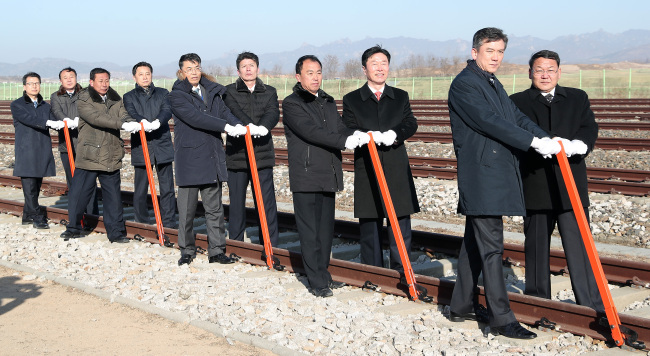 “A groundbreaking ceremony for reconnecting and modernizing the railways and roads of the north and the south on the eastern and western coasts of Korea was held,” the Korean Central News Agency said in a short English article. The KCNA said Ri Son-gwon, chairman of the North’s Committee for the Peaceful Reunification of the Country, and the South’s Transport Minister Kim Hyun-mi attended the event. It added that foreigners, including people involved in cooperation for building railways and roads, took part in the event, and that speeches were given during the ceremony, without mentioning what they were about. About 200 people attended the groundbreaking ceremony Wednesday at Panmun Station in the North’s border town of Kaesong.